Like many software development organizations today, yours may be seeking to improve software quality, reduce costs, increase transparency, and manage the development process better throughout the software lifecycle. You may face the need to operate within changed or changing paradigms such as increasing reliance on outsourced/offshore resources. And like increasing numbers of your peers (and your competitors?) you may have decided that adoption of CMMI is the direction you need to take your organization. Such a decision opens up a plethora of questions that need answers and issues to be investigated and resolved. Near the top of the list is probably something like: What tools are out there that can help us track data, automate procedures, communicate information, and ultimately achieve our goal of CMMI compliance? 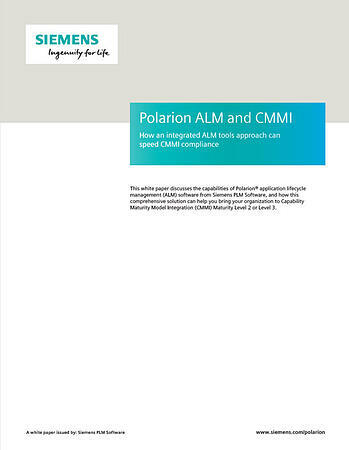 This article looks briefly at Polarion ALM Enterprise for Subversion™ and how this comprehensive integrated ALM solution can help you bring your organization to CMMI Level 2 or Level 3. It concludes with 10 more reasons you might want to evaluate Polarion ALM.